A Fijian believer and village headman has defended the strict observance of Sunday for men in Bua island by wearing traditional 'Sulu' sarong instead of pants. Galoa Village headman Josefa Baleinasiga said the ban was enforced so that the islanders could learn to respect the significance of Sunday as a holy day, he told the Fiji Times. Mr Baleinasiga said the Methodist Church and the vanua also decided to impose the ban as a means of bringing good fortune to the people. The vanua is an essential concept of indigenous Fijian culture and society which encompasses a number of inter-related meanings by which the Fijians identified themselves with. "The ban is meant to bring good luck to the island as we respect the day of the Lord," he said. "You can see that often misfortune befalls us because we don't respect His commandments that there be no work performed on Sunday except worship. "Before our islanders used to go diving on Sunday, and there was a lot of travelling and it was difficult to separate the days all the days were the same. "Now on Saturdays the clothes line in the village is full as the villagers know they can't hang anything out on Sunday." As a mark of respect, men can only wear a traditional sarong 'sulu or sulu vakataga' on the day; travelling by outboard from the island is not recommended. "But we make exceptions during emergencies for the sick so it's not a ban that hasn't been well thought out," Mr Baleinasiga said. A villager who requested anonymity said the ban was too restrictive because it limited movement. "We can't understand how wearing a sulu vakataga on Sunday will help us forge closer relations with the divine," he said. 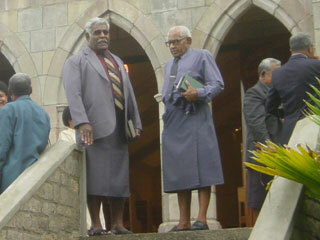 The Methodist Church, the biggest and most influential church in Fiji is inseparably linked to Fijian culture and society; over 80 percent indigenous Fijians are members of the Church. The all-powerful Fiji Methodist Church which counts 329,759 members out of a little less than a million Fijians estimated population has not responded officially to the new rule imposed by the village head in Bua island.